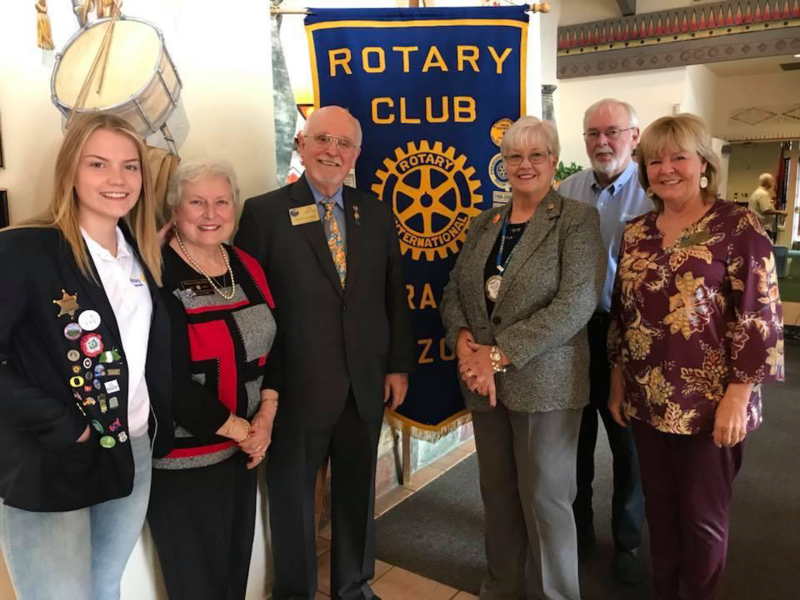 Rotary District Governor Joe Hentges came to town Monday to meet with Sierra Vista Rotary and deliver news from Rotary International, District 5500 and to present awards. He was accompanied by his wife Brigette, Assistant Governor Hank Huisking and Dis-trict Service Project Director Ray Naylor. DG Hentges met with SV Rotary Officers and Board members for over an hour before the luncheon meeting at Pueblo Del Sol County Club to learn about the allied 2018. He then joined the entire club where he delivered a rousing and informative presentation. Joe Hentges hails from Minnesota originally and was a teacher, administrator and accomplished musician during his professional career. A 35-year member of Rotary, DG Hentges is a member of the Marana Dove Mountain Rotary Club and now serves as Governor of District 5500 which encompasses most of southern Arizona from border to border and 51 separate Rotary Clubs. He was introduced by Assistant Governor Hank Huisking a member of the Sierra Vista West Rotary Club. He began by congratulating SV Rotary for its 58 years of existence and a reminder that the many service projects completed and planned by the club contribute to the Rotary theme this year "Rotary Making a Difference." The first award he presented is a new Rotary award called the Above and Beyond Award and was given to Karina Rice-Roberts for her tireless efforts on behalf of the club in Youth Service, Youth Exchange and Public Relations. Another award was given to President Nancy Fusco for her Paul Harris Plus 4, which means she has given at least $5,000.00 to the Paul Harris and Rotary Foundation for service projects around the world, scholarships and Rotary’s effort to eradicate polio. He then made a special recognition of all veterans retired and active in the club. He also set forth the Rotary International President’s challenge to all 35,000 clubs and over 1.2 million members to plant at least one tree this year. SV Rotary is looking at the purchase of four trees at the Forgach House as part of an extensive service project for that shelter. He concluded his presentation with a review of where Rotary and District 5500 is headed in the future; to empower it members to continue with the Rotary motto of Ser-vice Above Self by recognizing and developing club leaders, that even if our age may advancing Rotarians are "young at heart with plenty of energy to do good things in this community and the world. Rotarians must continue the legacy of supporting today’s youth with scholarships, literacy projects, leadership opportunities and foreign ex-change. Finally, Rotarians in Sierra Vista and around the world must not let down on our pledge to eradicate polio worldwide and that since its founding 58 years ago SV Rotary has contributed over $454,000.00 to polio eradication. Before receiving a standing ovation from the audience, District Governor Hentges reminded all Rotarians to stay service oriented and to have fun doing it.